Prince & Princess Academy Building Project | Education Is The Best Gift You Can Give To A Child! The Prince & Princess Academy Project Team is molding more blocks to continue the construction of the school, the blocks will be used to build an office, washrooms, kitchen and a small library. We hope you will continue to support the project. We are most grateful to the supporters and all those buying our postcards. Happy Birthday to the co-founder Prince Sisu!!! We have some great news! As a result of the efforts of the assemblymen and community leaders, the metropolitan council has paid a contractor to extend the construction of a nearby road that will allow vehicles, especially trucks coming into the community, to move much more conveniently! Below are some photos of the road construction. We recently hired a group to cut down a large tree located on site at the school building project. This was a difficult decision, but after weighing our options, we decided that if we have to build more classrooms in the future, we will need to remove this tree. Between now and then, it’s likely that more houses will be built near the tree. Having structures nearby poses a great risk that the tree might fall on something important. We believe it makes the most sense to cut down the tree at this time. Much thought was given to how we can use the tree. After speaking with the project supervisor, we learned that the branches are not straight enough to make proper boards for construction, and our idea of using the wood for desks would be too expensive because of the machines and carpentry involved. Instead, our project supervisor suggested we share the wood with underprivileged families in the community so they can use it as fire wood and as a resource for carving domestic artifacts to sell in order make a living. We also plan to plant more trees and flowers in the near future. We hope you all are doing well and want to say thank you again for your support. We will be back with more updates soon! Today’s update is very special. We would like to say thank you to Belen Zamanillo Mateo for visiting the Prince and Princess Academy Project site and helping with the construction. Belen, you are the first team member outside Ghana to see the school building, and we are most grateful to you for traveling all the way from your home in Spain, to volunteer. We hope you will come back again to teach in the school once it is completed. Below are some photos from our adventures and the work we did on the project site while Belen was in Ghana. Gracias, Belen! Dios te bendiga. You can now receive or send postcards from Ghana whiles providing support to the activities of our School Building Project for €3 euros each (minimum). Your postcard will be written and sent from Ghana with the Ghanaian stamp. We can even send a postcard to your friends and family as a surprise! We have 20 postcards for you to chose from, and you can make payment via paypal. Click here to view the postcards and make your order. All proceeds go to the Prince and Princess Academy School Building Project! With your help we will be able to achieve our next goal! Thank you so much for your donations. Your kindness and generosity are helping to make this project happen. The Prince & Princess Academy Project Team painted the fascia boards of the school building with green oil paint which will help repel insects and moisture. The next activity is to plaster the walls and floor of the classrooms with concrete before the ceiling and electrical works will be completed. Estimates of the next activity will be posted on the project website soon. We are most grateful to the supporters and all those buying our project African fabric shirts and postcards. We have a new update for you. We are in the process of painting the fascia boards of the school building with green oil paint which will help repel insects and moisture. While our project supervisor was painting, he fell from the scaffolding! Fortunately, he wasn’t badly injured, but in Prince Sisu’s attempt to save him from falling, he also suffered some minor scrapes and bruises. Oops! We are most grateful to all supporters who have helped us get this far and continue to support us. We will post a video update of the event soon! The Prince and Princess Academy Project Team. The Prince and Princess Academy Project Team have come out with a creative way to raise funding for the project. Our team member Princess Salma and a friend of the project Zenab, are talented in designing customized tops using African fabrics. The Team has nine (9) kinds of beautiful fabrics (cotton material) which are showcase in the photos below. We are selling each top (shirt) for $35, €30 or £26 (this includes the shipping cost) and 70% of the profit will go to support the school building project. The tops (shirts) can be made for both men and women including children. 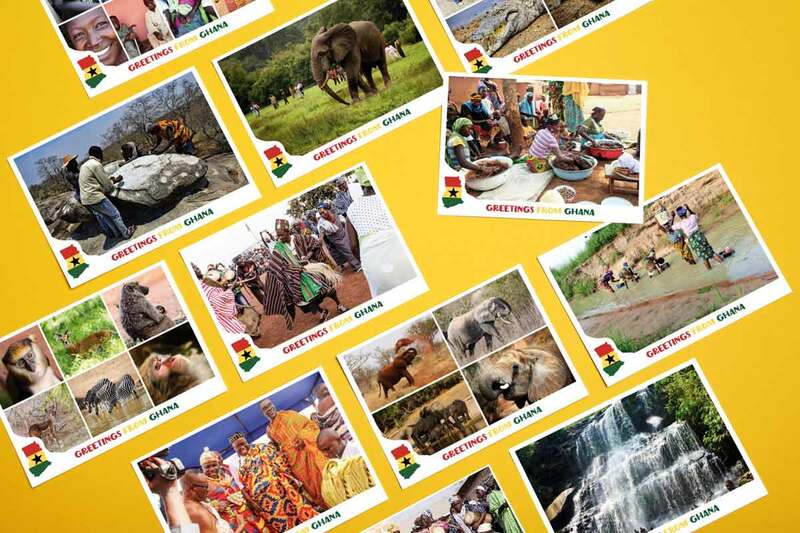 We will also include some postcards from Ghana. One of our fellow team member from Germany, Tanja, who was excited to purchase one for herself to celebrate her birthday – this is the one she is wearing in the photos! Over the years, Prince Sisu and his Co-founder Gadafi have designed these beautiful tops (shirts) for friends across the world. We hope you will check out our photos and message us about purchasing one of these tops! You are not only buying a beautiful shirt from Ghana but you are also contributing to the building of a school which will provide a brighter future for many children. As you might guess, supplies are limited, so contact us soon to make a request! You can also contact the Co-founder Prince Sisu on facebook to make an order. Click here for more photos of the designed tops.